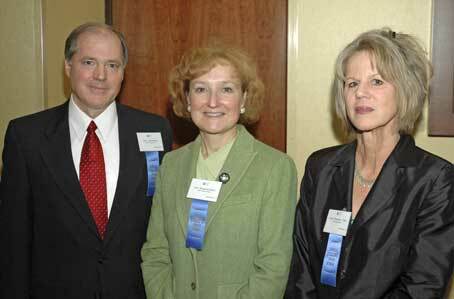 2007 CJI Judicial Excellence Award Honorees: Judge James (Jay) Breese, Judge Roxanne Bailin, Magistrate Dinsmore Tuttle. Denver, CO – More than 540 judges, attorneys, and members of the business and legal community joined the Colorado Judicial Institute on Thursday, November 15th to honor three outstanding judges and support a fair and impartial judiciary in Colorado. Prior to leaving on a trade mission to Canada, Governor Bill Ritter videotaped a special message for the CJI audience. Governor Ritter stated his belief that “a fair and impartial judiciary is a pillar of democracy and that the merit selection and retention election process the citizens of Colorado enjoy is the premiere system in the United States”. The Governor congratulated CJI on its 28-year record of working to ensure that “Colorado has the most fairly chosen, voter accountable, and well – educated judiciary in the country”. Speaking in person was the Governor’s Deputy Chief of Staff Stephanie Villafuerte. Ms. Villafuerte is a former federal prosecutor, chief deputy district attorney, and coordinator of the Governor’s transition team. She was honored in 2005 as “Prosecutor of the Year” by the Colorado District Attorney’s Council. Throughout her public service career, Ms. Villafuerte has been dedicated to combating child and domestic abuse. In her role as Deputy Chief of Staff she participates directly in reviewing the nominations of judicial applicants. “When selecting judicial nominees, the Ritter administration has received outstanding candidates and takes into consideration the needs of the court and the community that will be served”, said Villafuerte. CJI presented the 2007 CJI Judicial Excellence Awards. The winner in the District Court category, the Honorable Roxanne Bailin, Chief Judge of the 20th Judicial District, was appointed to the district court bench in 1987 and has served as Chief Judge of the Boulder-based district since 1998. Judge Bailin was honored for her leadership, innovation in streamlining court processes, ability to establish collaborative partnerships among varied departments and agencies, and commitment to providing responsive justice to all who appear before her. The winner in the County Court category was the Honorable James B. Breese of the Denver County Court. Appointed in 1987, Judge Breese was honored for his successful efforts to improve the justice system through understanding, education and cooperation. Judge Breese was instrumental in establishing an improved juror communication system and creating more user friendly juror rooms. The winner in the Magistrate category was the Honorable Dinsmore Tuttle of the 19th Judicial District. She was appointed a District Court Magistrate in 1997. Magistrate Tuttle is dedicated to helping parties move through the judicial system efficiently and achieving the best possible outcomes for all involved. Joining CJI at the dinner was Chief Justice Mary Mullarkey, Justice Michael Bender, Hon. Russell Carparelli, Hon. Robert Kapelke, Hon. Bruce Campbell, Hon. Robert Fullerton, Hon. Alfred Harrell, Hon. Lynn Karowsky, Hon. Kenneth Stuart, Hon. Lael Montgomery, Hon. Robert H. Russell, Attorney General John Suthers, and Department of Regulator Agencies Head Rico Munn. Funds raised at the Judicial Excellence for Colorado dinner support the CJI Judicial Education Fund the many programs of CJI. CJI thanks our many sponsors for demonstrating their support of Judicial Excellence and the efforts of the institute to protect judicial independence and improve the delivery of court services to the citizens of Colorado. Gold Sponsors Arnold & Porter LLP, Berg Hill Greenleaf & Ruscitti LLP, Davis Graham & Stubbs LLP, Gay & Lesbian Fund for Colorado, Holland & Hart LLP, Holme Roberts & Owen LLP, Patten, MacPhee & Associates, Inc., Qwest Communications International, Inc., Rothgerber Johnson & Lyons LLP, Shughart Thomson & Kilroy P.C. Silver Sponsors American Arbitration Association, Baker & Hostetler LLP, Burg Simpson Eldredge Hersh & Jardine, P.C., Colorado & Denver Bar Associations, Faegre & Benson LLP, GHP Horwath, P.C., Greenberg Traurig, LLP, Gutterman Griffiths PC, Haddon, Morgan, Mueller, Jordan, Mackey & Foreman P.C., Heckenbach Carlton Ammarell, LLP, Ireland Stapleton Pryor & Pascoe, PC, Isaacson Rosenbaum P.C., Judicial Arbiter Group, Inc., Kennedy Childs & Fogg, P.C., Littler Mendelson P.C., McElroy, Deutsch, Mulvaney & Carpenter, LLP, Morrison & Foerster LLP, Mountain States Employers Council, Inc., Perkins Coie LLP, Reilly Pozner & Connelly LLP, Robinson Waters & O’Dorisio, P.C., Sturm College of Law at the University of Denver, Wells Fargo Private Bank. Bronze Sponsors Arapahoe County & Douglas-Elbert Counties Bar Associations, Bieging Shapiro & Burrus LLP, BKD, LLP, Canges, Iwashko, Bethke & Bailey, P.C., CBIZ, Inc. & Mayer Hoffman McCann P.C., CIBER, Inc., Dufford & Brown, P.C., Gerash Toray & Gerash, P.C., Grimshaw & Harring, P.C., Harper Lutz Zuber Potenza & Associates, LLC, Kutak Rock LLP, Lindquist & Vennum PLLP, Lottner Rubin Fishman Brown + Saul, P.C., McConnell Siderius Fleischner Houghtaling & Craigmile, LLC, Miller & Steiert, P.C., Montgomery, Kolodny, Amatuzio & Dusbabek, L.L.P., Navigant Consulting, Inc., Netzorg McKeever Koclanes & Bernhardt LLC, Pendleton Friedberg Wilson & Hennessey P.C., Saltzman Hamma Nelson Massaro LLP, Sheridan Ross P.C., Silver & DeBoskey, P.C., Snell & Wilmer L.L.P., Townsend and Townsend and Crew LLP, Treece, Alfrey, Musat & Bosworth, P.C., Wells Anderson & Race LLC. Mountain States Employers Council, Inc. – for providing meeting space. Organization Background and Mission: Established in 1979, the Colorado Judicial Institute (CJI) is a nonprofit 501(c)(3) corporation dedicated to promoting excellence in Colorado’s judicial system. The Colorado Judicial Institute’s primary focus is the improvement of the delivery of justice in Colorado. CJI’s all-volunteer board is comprised of lawyers, judges and community members not actively involved in the private, public or corporate practice of law. In accordance with our bylaws, the majority of CJI’s Board of Directors must be neither practicing lawyers nor sitting judges. The mission of the Colorado Judicial Institute is: 1) to preserve and enhance the independence and excellence of Colorado courts, 2) to further public understanding of the Colorado judicial system, and 3) to ensure that the courts meet the needs of the people. CJI’s programs and committees are organized according to the three primary areas identified in the mission.